It had been eight years...eight filled years of homeschool co-op. But they were filled years. And by the spring of the eighth year, my shoulders slumped. They were no longer wide enough to carry the load of co-operative learning. I had fizzled out and needed some rest...some Sabbath-type rest that would nourish my soul. I had been so busy doing. planning. scheming. filling. 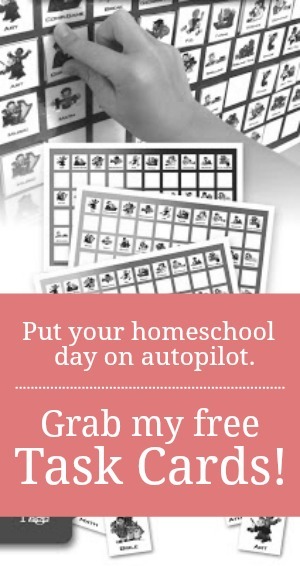 for all of my children that I had somehow forgotten about what I needed for homeschool. I had first heard of hygge (pronounced hoo-gah) two years prior when I read an interesting magazine article about winter blues. Living in the upper midwest which proudly boasts of a nine-month-long winter (or so it seems) with below freezing temps, I was fascinated by the Danish practice of hygge. Surprisingly, the Danes who also spend much of the year in the biting winter desolation and darkness, have ranked at the very top of the European Commission's well-being and happiness index for the past 40 years. In other words, apparently, Disney got it wrong. Denmark is the happiest place on Earth. But what makes the Danish people so defiantly content and even cheerful amidst the dreariness and drudgery of winter? How can they be peaceful and restful when winter is often woven in routine...and dare I say it, monotony? I wish I could scribble out a concise little definition for you; one which wraps up hygge in a neat American package. But the truth is, hygge is hard to translate. There's no English word for it. It's not so much a "thing" as it is a feeling...a concept...a lifestyle. In it's most uncomplicated terms, hygge is the Scandinavian practice of enjoying life's simple pleasures surrounded by friends, family, and often food. Hygge is coffee by the fire. It's snuggling together under a blanket with a good book. It's slow food and even slower conversation. Americans might call all of that hospitality. But since our version of hospitality often involves preparation, busy, attempts to impress or be impressed..."hospitality" seems to fall flat. It's so much more simple than that. It's about coziness. And togetherness. And warmth. And rest. It's about everything I was looking for after eight filled years of homeschool co-op. Somewhere towards the end of the weighty spring, and nearly one year after coming across that initial article, I read this lovely bit of words and knew my homeschool needed a year of hygge. A year of rest. How to hygge for homeschool? Motivated by my growing need for cozy togetherness, I sent out an appeal to two other homeschooling mommas. I invited them to join me in my quest for rest...my search for hygge. Like me, those ladies were tired. Parched. Empty. They needed to refill their happy and find a way to thrive, not just survive another wearisome winter. So we formed a plan and began the fall with rest. With kids in tow, every other Tuesday found us gathered at a home. We took turns welcoming and being welcomed. We'd slough off our snow boots by the door, pile our coats and mittens in a heap by the closet, and point our kids in the direction of play rooms or game tables. There was no real agenda. Expectations were low. It was always a slow morning filled with talking, laughing, and purposeful nothingness--me with my friends and my kids with theirs. Friendships deepened and a sense of family was forged. We embraced scruffy hospitality...overlooking piles of laundry on the couch, breakfast dishes in the sink, and toddlers running around in Super Man capes. We spread our arms wide to authentic living because it wasn't about the atmosphere, it was about the people. It was about the rest that can only be found in close community. It was about an unhurried, uncluttered morning spent over coffee and conversation. Like social circles of old, we, mommas, would often knit. But, sometimes even that felt like too much. And so, we'd just sit and rest and enjoy being with one another. The kids played board games, built snow forts, and felt safe with other kids who understood. Somewhere mid-day, an assembly line was formed. The three mommas would pause to make lunch. A simple spread of meat and cheese sandwiches on buns. Chips. Fruit. was the uncomplicated menu every time. No gourmet. No fuss. No decision fatigue. We'd linger around the table amidst spilled drinks and loud talk and we'd breathe deeply because this...THIS...was what our weary spirits craved. Sometime after lunch, we'd all pitch in to get the host's house back in order. Then, we'd slowly make our way out the door and eagerly anticipate our next chance to come together. "All people need a place where their roots can grow deep and they always feel like they belong and have a loving refuge." For us, that refuge came with hygge. We spent an entire year homeschooling this way. It was a welcome change to the busyness that had slowly begun to suffocate us all. Like Sabbath rest, the year of hygge had let us sit dormant...let us refill...let us re-focus. Next year, we'll be moving on from hygge and heading back to co-op. Because now I'm ready. That sounds lovely! Your explanation of Hygge speaks to my inner soul and it reminds me to refocus and find happiness in planning my next school year. Thank you for your blog and always your words of inspiration!! You're so welcome! Our year was a balm to my soul. So, was this a day off of school? No formal lessons? It sounds lovely, but I'm not sure my older kids could take a full day off every week. We met every other Tuesday on one of our non-school days. We have only ever homeschooled 4 days a week. I'm not sure how old your kids are. My oldest is in junior high. Here's what how and why we do a 4-day school schedule. I want this, not just for our homeschool but for our family. Intentional nothingness and rest. I'm not sure why that is such a difficult concept for Americans to grasp. For whatever reason, we wear our busyness like a badge of honor. But we crave rest. We need rest. I think it's tied into our American love of accomplishment and achievement, productivity. Any true rest and refreshing feels guilty and shameful because it didn't achieve or produce anything tangible. We've incorporated a few of our hygge elements into our current co-op. 1. We decided to meet in homes instead of at a church or public building. 2. We have a simple lunch together. 3. The learning part of co-op happens in the morning, and then after lunch, we stick around to just fellowship and enjoy friends. Did you do "school" of some sort on other days? Or unschooling? My daughter is going to be going to an unusual school in Mexico, after we move there later this year. It's kind of like unschooling under a roof, from 9-2 Mon-Fri. It's called Insight Academy, and the model began in--wait for it--Scandinavia! The headmaster says it's the most popular method for schools in Denmark. We have never belonged to a coop, and my daughter is a very social creature, so we're hoping it works for her. Yes. We did regular school all the other days. This hygge rest was just a replacement for our twice a month co-op. I've been reading all the books I can find on Hygge, after the death of my 21yo son last March, and a big move to our new home which we are building while we live in it---Hygge sounds like it's just what we need, in life, in family, and in homeschooling. Well done! 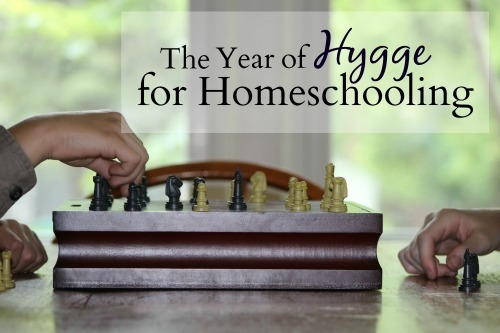 I may see if I can create a Hygge day with some local homeschoolers in my area too! Lord, have mercy. I'm so sorry for your loss. Leslie, I'm so very sorry for your loss. I can not even imagine the pain you must feel. May God be a comfort to you. We live in rural Minnesota and winter is really a hygge time in our homeschool. We've been at this a while (our oldest has graduated and the next will graduate in a few months) and still have a ways to go with our youngest in kindergarten this year. Winter is our inside, slow down, rest time here. We tend to be very busy with the garden and nature studies in the spring, with the Wilder Pageant (a local outdoor theater event in nearby Walnut Grove that most of our family takes part in every year), volunteer opportunities, foraging and gardening in the summer along with spending every bit of time that we can outside, and then harvest, putting things up and history events in the fall. This sounds amazing! We are finishing our 8th year of co-op this March. I didn’t re-enroll for the Fall because I needed a break. Thanks for giving us a peek inside. It sounds so refreshing.